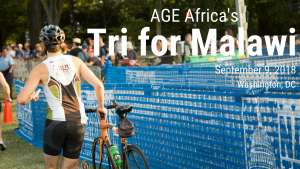 This year, AGE Africa’s Tri for Malawi is celebrating its 10th anniversary! Over the years, we’ve had a number of athletes take part in the Tri to show support for our programming and highlight the fortitude of our scholars, who travel a triathlon-length distance each week to get to school. We wanted to acknowledge our athletes’ efforts, so we are throwing it back each Thursday – in honor of #TBT aka #throwbackthursday— leading up to race day. What year did you start competing in the Tri for Malawi? This is my eighth year participating in the Tri for Malawi. What motivated you to do the tri that year? 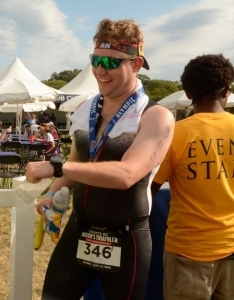 When I first participated in the Tri for Malawi, I had no experience doing triathlons. I hadn’t been bike riding since I was a kid, swimming one lap in a pool would leave me gasping for breath, and running two miles was my idea of a long run. When I was asked to participate in the Tri for Malawi, I loved the idea of challenging myself physically and mentally to train for a triathlon all while raising money for an amazing cause. Thinking of what the young women in Malawi go through every day just to get to school was a constant source of inspiration whenever I doubted my ability to successfully complete an Olympic distance race. What distance do you typically compete in? The first time I participated in the Tri for Malawi was the first triathlon I ever did. Now, I try to do two Olympic distance triathlons and a Half Ironman every year. The Tri for Malawi set me on a path down a new passion, much to my wife’s chagrin. What is the best part and/or your favorite part of competing in the Tri for Malawi? The best part of competing in the Tri is knowing that you have challenged yourself personally while raising money for young women in need. My favorite part of competing the Tri is that first (and perhaps second) guilt free beer after crossing the finish line. What is a downside of competing in the Tri, for you? The downside of the Tri is swimming in the Potomac. No way around it, it’s pretty gnarly. That being said, nothing is worse than when the swim is canceled. You put so much time into training, it is a shame not to put all the training into action. What is your favorite tri-related memory? My favorite tri related memory was seeing Ambassador Sawerengera competing in the cycling leg of a relay team. Although, I do remember that he was disappointed when he found out he was signed up for the Sprint distance rather than the Olympic distance. I think this year he is doing the Olympic, distance so I look forward to cheering him on while on the course. What is the best part of race day? The best part of race day is watching the sun rise over the Washington Monument and the Lincoln Memorial while you prepare your transition area before the race. The sheer excitement and nervous energy in the area is always thrilling. How do you feel on the starting line? No matter how many races I have done I am always a bit nervous at the starting line. I always ask myself a bunch of questions: Is my gear all sorted? Did I pack enough nutrition? Did I remember to check my tire pressure? Is that a shark in the water? What are you most looking forward to this year’s tri? Every year my goal is to do the course faster and raise more money for AGE Africa, so I am looking forward to hopefully achieving that. Would you continue to participate in the Tri for Malawi in the future? 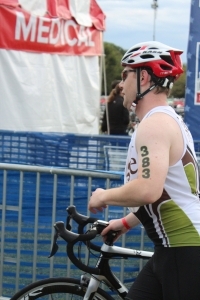 As long as I can still swim, bike, and walk – I will be participating in the Tri for Malawi. If you have been toying with the idea of participating in a triathlon but never had the motivation to start training, the Tri for Malawi is an amazing way to get into the sport. Raising money for a great cause helps give you the motivation to get out and train on days you would rather be watching Netflix at home. Having the network of other Tri for Malawi triathletes to ask basic equipment/training questions you feel stupid asking other people is enormously helpful. Most importantly, drawing on the challenges that young women in Malawi go through every day is an incredible source of inspiration to get you over the finish line. For those of you competing this year, good luck on race day!